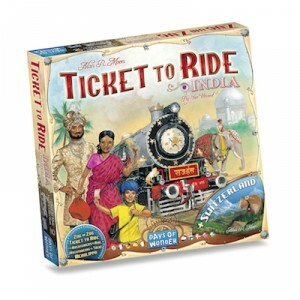 The new Ticket to Ride India expansion is now available at game retailers in North America and around the world, as well as at the Days of Wonder web store. This second volume of the new Ticket to Ride Map Collection series includes a double-sided game board with the map of India for 2 to 4 players, plus Ticket to Ride Switzerland, the terrific but long out of print map for 2 and 3 players. Learn more on the Ticket to Ride India web page. Ticket to Ride Asia available in U.S. Ticket to Ride Asia – the first volume in the Ticket to Ride Map Collection – goes on sale tomorrow (Wednesday, Nov 16) in retail stores throughout North America. This expansion to the popular Ticket to Ride series features two different maps on a double-sided board. In Team Asia, 4 or 6 players collaborate in two-player teams to complete shared Destination Tickets. On the flip side, Legendary Asia features a new Asian Explorer bonus for connecting the most cities and takes 2-5 players through hazardous Mountain Routes that force you to discard a train (the Himalayas are hard on rail cars!) You’ll need trains and train cards from either Ticket to Ride or Ticket to Ride Europe to play. 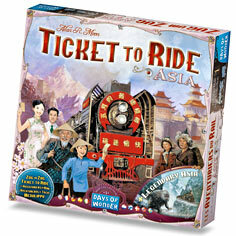 Make some time to visit your friendly local game store this week and pick up Ticket to Ride Asia. If you’ve pre-ordered from the Days of Wonder web store your shipment will also leave the station by tomorrow. Learn more on the Ticket to Ride Asia web page. Due to manufacturing delays, Ticket to Ride India – Map Collection Vol. 2 will be available a little later than we previously expected. In Europe, this new expansion for the Ticket to Ride series is expected to be on sale at game retailers the first half of December. The Days of Wonder web store in Europe will begin taking pre-orders on November 18. In North America, Ticket to Ride India will be available in the first half of January. The US web store will begin taking pre-orders on December 8. 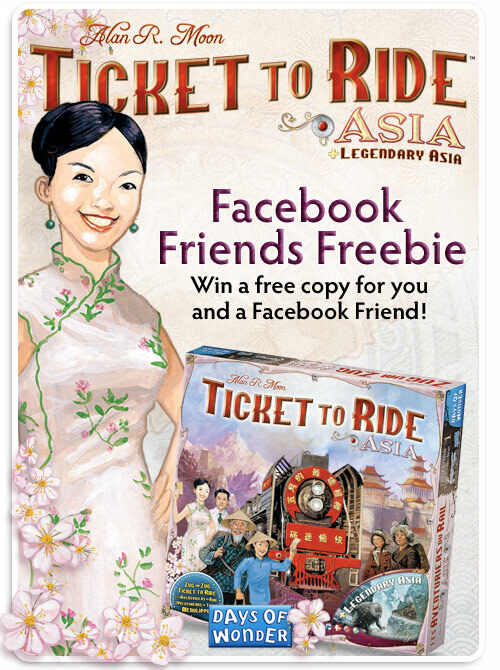 The Facebook Friends Freebie Contest is over and 10 Days of Wonder fans have won a free copy of Ticket to Ride Asia, the new expansion to Ticket to Ride. Congratulations to: T Isaacson, M C Kimball, M Ares, S Vega, P van Bennekom, S Banks, D Boudreau, L Johannsen, T Stewart, and R Lo! Not only will they receive Ticket to Ride Asia, but we’ll also send a copy to the Facebook friend of their choice. Thanks to everyone who participated. Be sure to check out Ticket to Ride Asia! Ticket to Ride for iPad was awarded a Special Jury Prize as the 2011 Digital Game of the Year in Denmark this week. Learn more at the Ticket to Ride for iPad webpage or in the App Store. Get ready for new Train Adventures!